People’s needs in Central African Republic (CAR) have increased significantly in recent months, the top United Nations aid official in the country warned on Wednesday, amid worsening localized violence that has included the recent torching of two camps for displaced people. Speaking to journalists in Geneva, UN Humanitarian Coordinator Najat Rochdi urged the international community to help CAR, explaining that 2.9 million people in need of assistance and protection out of a total population of some 4.6 million “is a big deal”. In the past three weeks alone, more than 50,000 people have been affected in Batafango town in Ouham prefecture, and in Alindao town in Basse Kotto prefecture, where assailants burned down two main sites for displaced people – a tactic never before seen in CAR. “The world cannot turn a blind eye to what is happening in the CAR. We are back to square one!” she said. “It is a conversation that has started,” she said, adding that the fact that this year’s $516 million CAR appeal was only 50 per cent funded meant that “realistic” decisions had to be taken about which communities to help. And highlighting the scattered nature of the violence in CAR – a country of huge natural wealth in the form of diamonds, gold and uranium – the UN official noted that there was good news in some areas, not least the spontaneous return of displaced people in the south-west. 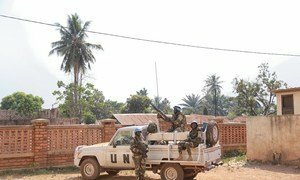 Amid a recent uptick in violence in the Central African Republic (CAR), United Nations Secretary-General António Guterres on Saturday said he stood in solidarity with the crisis torn country and warned that attacks against defenseless civilians and UN ‘blue helmets’ may amount to war crimes.